In Industrial Ventilation Inc.’s quest to be the technology and service leader in vegetable storage industrial ventilation, IVI employees are continually seeking out new and updated research to compliment their own professional knowledge. The recent pivot into sweet potato storage, leveraging the system of products and treatments already in place for potatoes and onions, has created an opportunity for IVI’s head of Southwest Sales, Jeff Nielsen, to dive deeper into the intricacies of the sweet potato. Namely, the storage concerns it shares with its Irish cousin versus the concerns that are distinctly its own. One of these distinct concerns affecting sweet potatoes is the effect curing and storage temperature have on the soluble sugar content (Brix). Since the sugar content of most sweets is low at harvest, resulting in a not-so-sweet “green” sweet potato. Curing, the process of holding the sweet potatoes at an elevated temperature for 5-7 days, enhances the potato’s flavor by converting starches to sugars while also helping to heal cuts and surface abrasions, thereby reducing decay and shrinkage in long-term cold storage. After attending the NC State Sweet Potato Field Day, Nielsen’s curiosity was peaked on the issue of optimizing Brix % and he set off to find some definitive research on the influence of varying times and temperatures on the sugar content. In his search, he came across a very thorough study by the Caribbean Food Crops Society in the Virgin Islands from 2014. 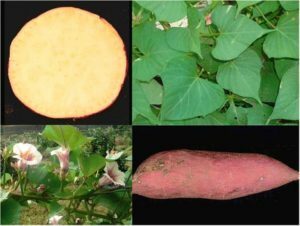 In this study, the researchers chose nine sweet potato varieties (one of which was the Beauregard). To analyze the effect of storage temperature on Brix, all 9 varieties had their initial levels recorded upon harvest, followed by an ambient cure at room temperature (80°F) for 5-7 days. Post curing, all varieties were divided into thirds and placed into storage at 40, 60 and 80°F for a total of 35 days combined curing and storage. Brix levels were measured every 7 days on all 9 varieties and at all 3 holding temperatures. 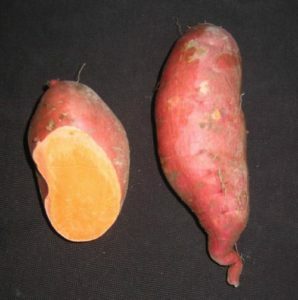 A similar variety to the common Beauregard “B-63”, which was released by the Louisiana Agricultural Experiment Station in 1987, this variety is popular in the USA and has rosy-tan skin and orange flesh. Tested “B-14”s started at 6% Brix. While sugar content increased at all 3 temperatures over the 35-day period, the sweets stored at 60°F had the highest percentage increase overall, with the largest jump between 14 and 21 days (~11% Brix) and finished at ~12.5% Brix. The Liberty variety was developed fairly recently. It has red skin and cream flesh and was developed for drought tolerance and weevil resistance. The Liberty began with ~5.8% Brix. It had impressive increases in sugar content over the 35-day period for all temperatures but the largest increases at 60°F between 0 and 15 days (~11% Brix) and again at 21 to 28 days (~13.5% Brix) and ending at ~14.8% Brix. Brix initially dropped for 40° and 80°F temperatures between 5 and 7 days, making 60°F especially preferable for shorter curing times. This is also a newer variety that has dark purple skin and flesh. The VIP started at a higher Brix of ~11%. It had more variable increases at the various temperatures test, with 60° and 80°F performing best at 7 days (~11.8%), all three temps performing equally at 14 and 28 days (~12%), 80°F performing best at 21 days (~14%), and finally 60°F with the highest overall increase at 35 days (~16% Brix). 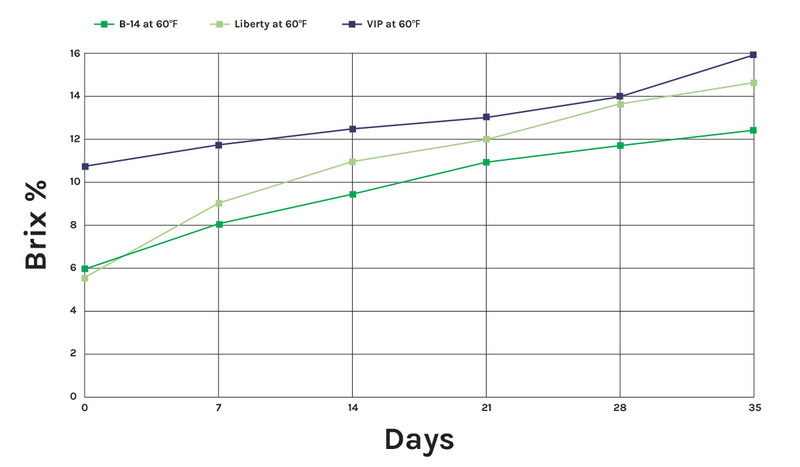 In summary, except for the “VIP”, the Brix levels more than doubled when cured at 80°F for 5-7 days, followed by an additional 28 days at 60°F. Sweet potatoes held at 40 and 80°F had minor increases, comparatively. See all of the studies findings in the study PDF. Our take away: reliance on open doors and cross ventilation exposes the potatoes to inconsistent pile temperature, humidity and CO2, eroding your hard earned profit margin. An advanced storage system from IVI will provide a percentage of free cooling and an end to stratified air, sprouting, chill injury, and pithiness. This gives you a higher return on investment through optimum quality and minimized shrink and breakdown, all the way through the potatoes’ first birthday, and keeps your customers coming back for more of a good thing. With this excellent information on hand, IVI storage systems can set you up for success. Our control panels are easy-to-operate and control all of the key parameters of storage, from humidity and temperature, to air flow. This means maintaining that 80°F for 5-7 days, 60°F for 35 days, and subsequently reducing it to your preferred storing temperature (all within a .01°F) just got easier (and extremely precise). Want to improve the quality of your storage even more? Our Humidicell Evaporative Coolers and Prop Fans are an ideal addition to your storage structures in order to maintain an appropriate relative humidity to prevent shrinkage and diseases. IVI has engineers available to help maximize the storage environment with your existing storage, and can help you with construction plans from the ground up. We can bring our years of development and success with optimal root crop storage to the benefit of your sweet potatoes. Contact Jeff Nielsen to learn more about how IVI can help with your sweet potato storage goals. 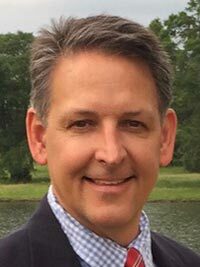 Jeff is head of Southeast Sales for IVI. He has been working for IVI since March, 2017 and has a Bachelor’s degree in Industrial Technology–Manufacturing/Materials/Processes from the University of Wisconsin-Stout. Montilla, C., Harris, H., Smart, R., Gordon, J., Zimmerman, T., (2014). Influence of Storage on SweetPotato Sugar Content. (Proceedings of the Caribbean Food Crops Society. 50:89-92). Retrieved from https://ageconsearch.umn.edu/, January 28, 2019. Post edited on February 21, 2019.